We have one Gite as well as our House.The Pool is in a completely private secluded area away from the house. The feature of the sitting area is The Bread Oven where the bread was baked as far back as 1881. Sitting room has a tv, dvd player with selection of dvd's, wifi and wifi speaker for garden available on request, as well as a selection of games and books in bookcase. The dining room has a 4 seater adjustable table with matching sideboard, all china and crockery can be found here. The kitchen has a wide selection of cooking utensils, cutulery, china, and glasses as well as a 2 ringed hob. It also has a countertop oven and microwave as well as a fridge with a small freezer compartment. This bedroom has a large double bed with memory foam mattress which can be adjusted to sit up for reading in bed as well as a wardrobe for hanging clothes. This bedroom can be made up with the option of a superking or twin bed, all matresses are memory foam. There is a large French wardrobe for hanging space. The shower room has a modern shower, wc and sink. The private pool newly installed in 2017 is 10 by 5 metre in size and is of uniformed depth.The pool is heated and uses a saltwater chlorination system. The Pool will be heated between May - October. The newly built pool house is fully equipped with plastic utensils, fridge freezer and bbq. Table and chairs are provided for eating in this area as well as comfortable sofa to relax and shelter form the midday sun.The pool house and gite are surrounded by beautiful long flower beds which contain herbs and wildflowers that grow throughout the season.The gite garden has large trees for shade.The entire property has unspoilt views all around. Danny and I met in london in 1987, after living in various locations we settled in Blackheath South East London.I am a qualified beauty therapy trainer and I trained for Clarins UK for 25 years. Danny worked for Net-A-Porter the worlds leading online fashion company.Danny and I had always discussed the possibilites of running a small holiday business. We decided to leave the UK and look for a more relaxed way of life in rural France. Danny and I with our two dogs Hannah (Bichon) and Louie (Korthals griffon) viewed and fell in love with La faurie straight away. We bought the house in November 2016 knowing that this rural quiet area would be an ideal place to run a small Gite from. We started work to put in the pool straight away,its totally private and includes a fully equipped pool house which has a fridge freezer, bbq, plastic utensils (safety reasons) table and chairs plus a sofa for relaxing. The Pool will be heated between May - October. We also have private pond which has Tench and Carp surrounded by wildflowers as well as a stunning weeping willow. there is a very generous garden surrounding the Gite which leads up to the pool. The land surrounding our house is a mini orchard that includes walnuts, Cherries, Apples, pears, peaches, Quince, Hazelnuts and 2 stunning very large Fig trees. We also have 2 Acres of forrest to the north of the property. This area is totally unspoilt and very rural with Farmers going about there daily business,we just love being here. The area is an official dark sky area meaning no street or town lights to interrupt the stunning clear sky at night where the stars are simply amazing.The property enjoys no close neighbours making it extremely quiet.The beautiful bread barn(gite)is in a courtyard with the main house and old wine barn, wine was produced from vines on the land many years ago.The property retains a unique Charente character found within this area and dates back to 1881.
private parking space for the accommodation. Pot bellied wood burning stove sits in front of the old bread oven, wood provided. comfortably seats 4-6 people on Italian leather and linen furniture. large coffee table. under counter fridge with small freezer section, we can supply a box freezer if needed. We have a 2 ringed hob. we have a filter coffee maker and a cafetière. fully equipped, happy to supply anything extra thats needed. In the kitchen area we have a countertop oven, 2 ringed hob, sink, microwave, Toaster, coffee perculater under counter fridgefreezer, additional freezer if needed. 2 cupboards. selection of books to read as well as books on the area. A selection of board games. as well as outside football table and French Boules. A full range of adult and Children's Videos provided. Table, chairs, and loungers provided for the garden area as well as bbq. super large fig tree dominates the garden area as well as giving shade. there are 2 levels to the garden area both have trees. a variation of adult and children's bicycles are available free of charge. 2 generous garden areas as well as the pool area and a tiled terrace next to the pool. Brand new totally private 10 x 5 metre salt chlorinated pool of uniformed depth. the pool has totally uninterrupted views of the surrounding countryside. Pool house for seating and shade. Monique can offer a full range of beauty treatment therapies. Monique worked as a Training Manager for Clarins UK all over the UK but mostly in central London for 25 years she is highly trained in full body massage, facials, swedish massage, aromatherapy, deep tissue, indian head massage as well as Reiki. Treatments can be carried out within the Gite or a room within our home as well as around the pool its your choice. This place is an absolute gem! Set in a stunning part of the world, the gite itself is spacious, exceptionally well furnished & equipped, and full of character. Certainly the nicest gite we have ever stayed in. The large exclusive gardens provided us with loads of space to relax. 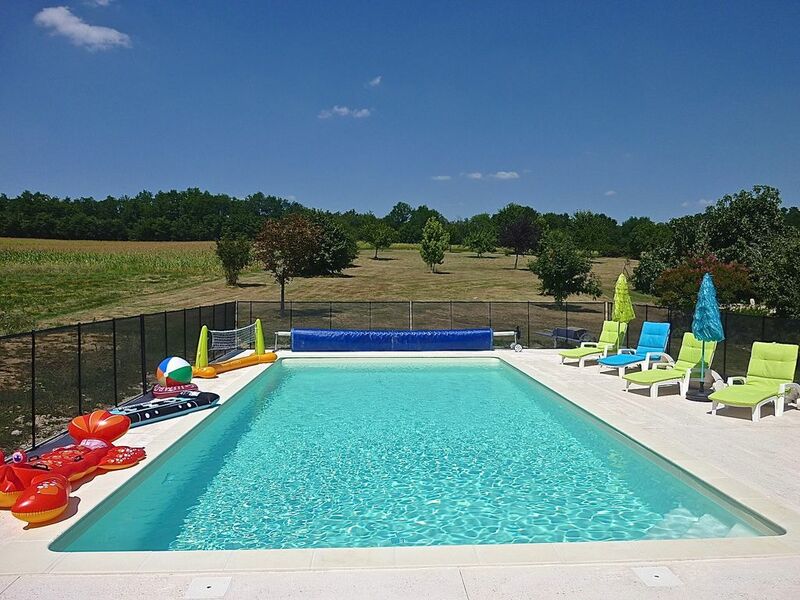 We ate almost every meal outside during our 2 weeks (using the BBQ most evenings), and the kids (2 and 5) loved roaming around and exploring.The pool was perfect & private, with beautiful views over the rolling countryside surrounding the gite. The pool house & kitchen were a real bonus, meaning we often had drinks and snacks poolside whilst the kids played in the water. The fence & gate meant it felt very safe too. Danny & Monique were absolutely fantastic hosts. Our gite, pool & gardens were very private and exclusive and not overlooked at all, but if we ever needed anything they were delighted to help. They got the balance absolutely spot on. Although we could quite happily have spent the entire 2 weeks without leaving, we made quite a few trips around the area. Swimming at the river beach in St. Aulaye and at Lac Jemay were real highlights for us. We also borrowed some bikes from Danny, and really enjoyed exploring the countryside. Although not a massive fisherman, I also managed a couple of hours on the pond catching some of the tench & carp! We can't speak highly enough of this place. If you've read this far, book now! Thank you very much for those kind words Rob thoroughly enjoyed having you Helen and the Children here, Look forward to you all coming back very soon. What a wonderful break! We spent a week here in August 2018 as our family summer holiday, two adults and two kids, 8 and 5, and enjoyed every minute of it. Danny and Monique were excellent hosts, always on hand to help and advise, but very conscious of giving us the space and privacy to enjoy this beautiful spot. The gite was clean, very well decorated, well appointed and very comfortable. Even in the heat of the summer it was very cool in there. The garden was a good size to have a run around in with the kids and had plenty of seating, loungers and a bbq. The highlight, and one of the reasons we booked here, was the private pool, which we had exclusive use of. It has a security fence around it for peace of mind and is set up so well with tables, chairs, loungers, fridge, sink and cutlery/ crockery that you can easily spend all day lazing around there...and we did! Danny kept the pool and surround spotlessly clean, meaning all we had to do was enjoy it. We kept sight-seeing to a minimum but enjoyed trips into Angouleme and the beautiful, nearby Villebois-Lavalette, where there is a chateau, supermarket, boulangerie, a Saturday market and various restaurants. We particularly enjoyed the pizza place, which served enormous, tasty portions and where we were made to feel very welcome. There was plenty more in the area which we could have done, but were determined to just chill out. All in all an excellent break and one which we do not hesitate to recommend. We came away tanned, relaxed and with some great memories. It was lovely having you all here, glad you enjoyed your stay with us we would look forward to welcoming you all back. Beautiful property with outstanding garden & pool! We have used HomeAway for several years very happily and this was the best property, garden & pool we have ever had! We loved it. Beautifully presented accommodation perfect for our family of four (two kids 9 & 12), and the private garden and pool were amazing. My husband and I thoroughly enjoyed our week and the kids were happy for hours in the pool. Danny & Monique were wonderful hosts and I would thoroughly recommend this property to others. We enjoyed short day trips to Aubeterre (beautiful village) & Angouleme, and enjoyed canoeing and nearby Castle Villebois. Lovely week for the whole family! Our local town Villebois-Lavalette is a commune in the Charente department in southwestern France. It was the seat of the former Canton of Villebois-Lavalette, and is located on a prominent hill which has a château dating back to Roman times.In the centre of the old town, there is an old wooden covered market that dates back to the 16th century. It was restored in the 19th century and is now a historic monument. There is a small, but lively market every Saturday morning. A 17th-century sundial can be seen on a house that overlooks the market hall.The town is a reasonably small one with banks, cash machines, newsagent, 2 chemists, 2 boulangeries, a tourism office, garages, a large supermarket, doctors/dentists, builder's supply store, cafe, hotel and restaurant. Bordeaux 1.25 minutes away by car is the world's major wine industry capital it is home to the world's main wine fair, Vinexpo and the wine economy in the metro area takes in 14.5 billion euros each year. Bordeaux wine has been produced in the region since the 8th century. The historic part of the city is on the UNESCO World Heritage List as "an outstanding urban and architectural ensemble" of the 18th century. After Paris, Bordeaux has the highest number of preserved historical buildings of any city in France. Bergerac 1 hour 30 minutes by car sits on the northern bank of the Dordogne river. The old town has an extensive medieval centre, the main square " The place Pelissiere" is where you can find the wonderful Saint Jacques church which forms part of the Saint Jacques de Compostella pilgrimage which has four different starts, Paris, Vezelay, Le Puy and Arles and finishes at Santiago de Compostella. Cognac 1 hour by car. The first thing that comes to mind is the world famous Cognac Brandy which is produced in this area you can sample by visiting one of the famous distilleries.The old town is medieval and has narrow cobbled streets, castles and other historic monuments to visit. This area of the south west France offers some beautiful river beaches for a fun day out they all offer picnic areas but many also have a Restaurant and toilet facalities Saint Aulaye 33 mins drive Aubettere sur Dronne 26 mins drive was officially listed as one of the prettiest villages in France. Lac Jemaye 40 min drive also has a beautiful woodland park for walkers and cyclists a great place to unwind. Manoir de Longeveau 19 min drive, is a wonderful 9 hole course. You will find a wonderful traditional French market every day of the week selling a variation of all local produce as well as antiques and hand crafted gifts. Brocantes (flea market) and Vide Greniers (empty attic) are markets with local people selling household goods and wonderful unusual things as well as great food. we love attending these events and strolling around with the dogs looking for unusual things. One of the most amazing places that we like to visit is Dune Du Pilat 2.5 hour drive learn more about Europe's tallest sand dune nestled between the Atlantic Ocean, an enormous pine forest, the Arcachon Bay, a sandbank and a peninsula! All these ingredients make it a unique landscape in Europe and probably throughout the world. It is sometimes described as a "menacing sand wall" or even called a "sand monster" swallowing up "parts of France".